In the web site The Hindu, Indian journalist Khallol Bhattacherjee said in his article on November 14 that President Rodrigo Duterte is unmatched among global leaders in terms of hitting headlines and creating controversies. Bhattacherjee said that Duterte follows in the footsteps of Presidents Joseph Estrada, Gloria Arroyo and Ferdinand Marcos, as well as his first lady, Imelda. 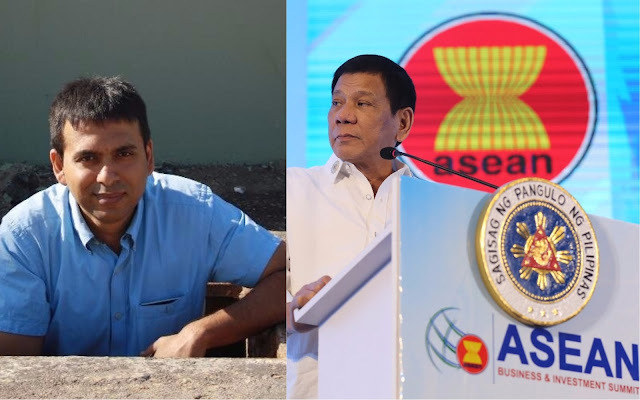 He said that it is evident that Duterte has dominated the news pages from the first moments of the gala dinner of November 12, when the 19 participating leaders, Prime Minister Narendra Modi included, appeared in the ‘family photograph’ of ASEAN and East Asia Summit, in Barong Tagalog. He said that even United States President Donald Trump was impressed with Duterte who attended the official meetings in informal attire. “Ladies and gentlemen, I sang uninvited a duet with Ms. Pilita Corrales upon the orders of the commander-in-chief of the United States,” Mr. Duterte said, laying the responsibility of his performance with the U.S. leader. He said that along with Duterte, Chines Premier who gained a lot of media attention. The Chinese leader also wrote a widely-read front page article on Philippines-China ties that have been caught in the South China Sea dispute in recent years. "However, it appears that in terms of creating controversies, Mr. Duterte is unmatched in South or Southeast Asia as he continues to quip or comment in his usual provocative manner. Mr. Duterte, whose war on drugs has been criticised for denying due process of law to those accused of narcotics smuggling, has now proposed to host a global human rights summit in Manila." He noted how Duterte championed for migrant workers which he said, will be beneficial to migrant workers not only from the Philippines, but also from other countries who are often ill treated. The ASEAN Summit was held this week in Manila, Duterte being its chairperson. In the season of international summits and global leaders, the focus of all the newspapers in Manila appear to be on the local flamboyant leader, Rodrigo ‘Rody’ Duterte and the U.S. President Donald Trump. But when it comes to hitting headlines with sound bytes, Mr. Duterte is more effective than Mr. Trump. Mr. Duterte follows in the footsteps of his famous predecessors like Joseph Estrada, Gloria Macapagal Aroyo, and the authoritarian and stylish Marcos couple — Ferdinand and Imelda. From the first moments of the gala dinner of November 12, when the 19 participating leaders, Prime Minister Narendra Modi included, appeared in the ‘family photograph’ of ASEAN and East Asia Summit, in Barong Tagalog, the traditional white shirt of the oceanic country, Mr. Duterte has dominated the news pages. Mr Modi, however, scored on November 13 when prominent trade bodies of the region put out full page advertisements in local dailies. In all, Mr. Modi received four full page advertisements. Chinese Premier Li Keqiang also had lot of media attention, as his is the first such visit in a decade and the Chinese leader also wrote a widely-read front page article on Philippines-China ties that have been caught in the South China Sea dispute in recent years. However, it appears that in terms of creating controversies, Mr. Duterte is unmatched in South or Southeast Asia as he continues to quip or comment in his usual provocative manner. Mr. Duterte, whose war on drugs has been criticised for denying due process of law to those accused of narcotics smuggling, has now proposed to host a global human rights summit in Manila. The Philippines leader has championed the ASEAN consensus on migrant workers that is likely to help migrant workers from Philippines, Thailand and other countries who are often ill treated and denied human rights.